Your first harvest is always special, but we have particular reasons to remember ours. Firstly we had had some problems with powdery mildew during the year, mainly as a result of poor spray cover brought on by having too much growth. We also had problems with bunch rot in the Phoenix - an occurance that continues to plague us. As a result the harvest was very slow as we had to sort the good from the bad, often down to selecting berries from a bunch. In later years we have got a bit more sanguine about this but with your first crop you want to harvest every good berry, and only good berries! The run-up to harvest had been pretty wet and I hadn't had a chance to get out and cut the grass between the rows. From the picture alongside you would have thought we had perfect picking weather but actually it was cold and pretty damp. Most of the crop was brought in during a consistent light drizzle. Not enough to spoil the crop but enought to make us thoroughly miserable. We picked just under a ton of grapes, with the Reichensteiners the best performer, followed by the Angys then the Phoenix. 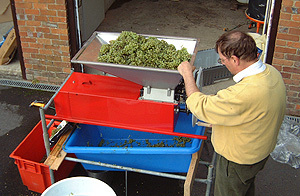 The grapes went straight into the crusher/destemmer. As you can see from the picture I saved on buying the official stand. This was a mistake that I have since rectified! I also saved on getting the powered version, so after harvest my right arm looked like Popeye's. 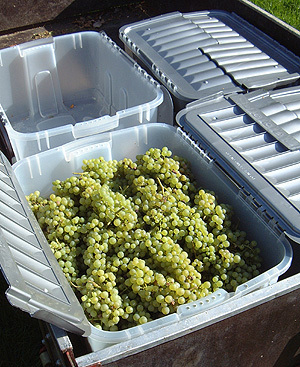 Once crushed the grapes were allowed to stand in large food grade plastic tubs to macerate typically overnight (with the addition of SO2 and pectolytic enzyme). This practice doesn't seem to be too widespread in England as the common practice is to press immediately. I think it allows for greater flavour extraction from the skins. You do have to be careful not to pick up too many phenols though. After standing the must was pressed in our 90l hydraulic press. This is a small hand unit that we acquired from another vineyard. It is actually a bit small for our needs but it works fine - just rather a lot of loading and unloading required. It is powered by mains water pressure alone. As simple as connecting the hose. You can see the connections in the picture below. You can see the water coming out of the bottom of the press as the pressure is released. We now recycle this water for cleaning. Once pressed the juice was left to stand for 48 hours and the clear juice was taken off the gross lees and into our stainless tanks ready for innoculation with yeast. 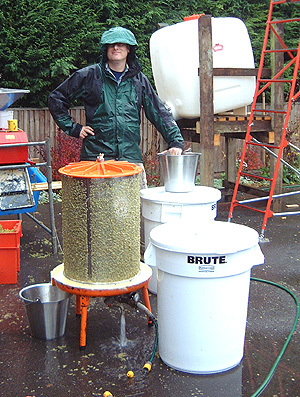 In total we collected about 550 litres. 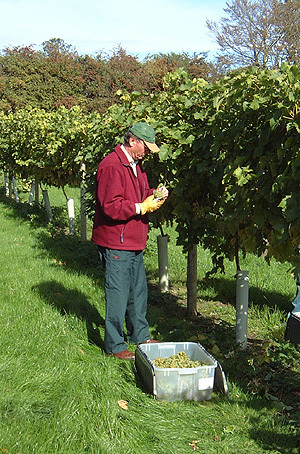 We fermented all three varieties together and the result was our 2004 Letcombe Brook, which went on to take two "Highly Commended"s in the regional wine competition. For more on the wines themselves see the Wines section.